� High quality CRCA sheets are used for fabricating the boards. padlocking arrangement are included as basic features. carried out by powder coating process. maximum of 6 outgoing in a vertical panel. � Drawout Breaker of ABB / L&T / SCHNEIDER/ SIEMENS. � Designed as per IS 8623-1993 / IEC 60439.
primary current ratings with 1/5 amps secondary current. » Control transformer (fixed type) can be supplied on request. Reputed brand of Analog / Digital meters shall be provided to suit the customer requirements. 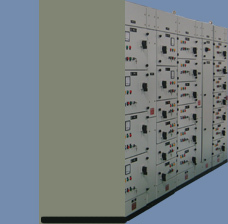 The panel is type tested for short circuit, temperature rise and ingress protection at CPRI.